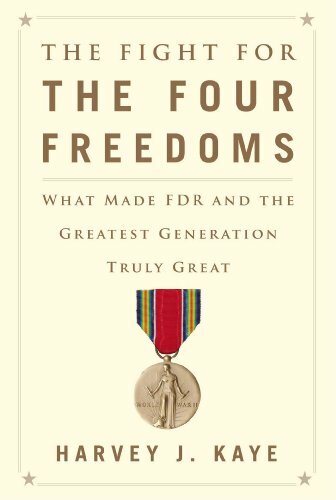 Thus Harvey J. Kaye asserts in his new book The Fight For the Four Freedoms: What Made FDR and the Greatest Generation Truly Great. Kaye's book retells the history behind the genesis of President Franklin Delano Roosevelt's Four Freedoms speech. The book also acts as a kind of counter-revisionist interpretation of the Founding Fathers. This involved FDR's linkage between his radical transformation of American life through the New Deal and its alleged historical precedents established by the Founding Fathers in the US Constitution and Bill of Rights. Harvey J. Kaye is the Ben & Joyce Rosenberg Professor of Democracy and Justice Studies at the University of Wisconsin-Green Bay. How are Democracy and Justice Studies akin to the academic practice of history? If this book is any indication, it is a historically accurate, albeit superficial, examination of FDR's political policies, leavened with a not undue amount of partisan cheerleading. It also lacks the requisite intellectual muscle of a history book written by a law professor. Many of those policies, like Social Security, are still deeply entrenched within the American system of governance, in addition to the parks, artwork, and architectural structures created with WPA patronage. (The lists are too numerous for this review, but Kaye provides many inventories of government agencies that brought the U.S. out of free market capitalism's monstrous creation, The Great Depression.) Although not mentioned in the book, FDR's achievements and the nation's egalitarian impulses reflect the zeitgeist of Andrew Jackson's presidency. Can a historian write positively about a set of presidential policies without coming across like a partisan cheerleader? Those interested in the demolition of the New Deal should read The Age of Reagan, by Sean Wilentz. Wilentz, like Kaye, is a vocal liberal, but he presents the history in a more even-handed in-depth manner. The problem with Kaye's account is that he lauds FDR for his achievements but downplays his faults. The Japanese-American executive order is excused as FDR falling under the nefarious persuasions of his military planners. The partisan cheerleading becomes more explicit with the constant criticism of third parties. At the present time, with a political system crippled by gridlock, ideological extremism, Big Money dictating the small brains of both the electorate and those they elect, disparaging third parties seems both nakedly self-serving and dangerous. It becomes apparent whom Kaye is rooting for when the Index is brought under scrutiny. In a book that allegedly promotes the achievements of the New Deal, not a mention of either Democratic Senator Elizabeth Warren, Ralph Nader's 2000 presidential run, or any mention of Bernie Sanders. For those nauseated at the ineffectual and universally corrupt nature of the two-party system, these absences need an explanation. The greatest threat to the Four Freedoms is the two-party system, just don't expect to hear that from one of its cheerleaders. The other aspect under consideration is Kaye's assertion that the Greatest Generation was the nation's more progressive and radical. While FDR did have majority support in both public opinion and in Congress, the achievements of the New Deal and America's postwar wealth involve more than FDR's policies and the hard work of laborers, soldiers, and the like. With Great Britain bankrupt, France deeply wounded, and the Soviet Union suffering 20 million war deaths, the United States stood unique and relatively unscathed by the Second World War. With a monopoly on nuclear weapon technology (at least for a little while) and war laborers with swollen checkbooks from accumulated savings, it paved the way for a massive upsurge in development, spending, and general prosperity (at least if one was white). Kaye simplifies matters to a political black-and-white scenario. While the Democratic Party did become a party of national salvation during the Thirties and Forties, it is harder to make that statement today. The achievements of the Greatest Generation and the policies of FDR are without equal in American history, but the narrow focus and the crass partisan cheerleading ruin an otherwise fascinating introductory volume for those interested in the New Deal.